UNTAPPED RESOURCE: CTA chairman John Cyopeck thinks trucking should be making better use of rail - and rail should recognize that one load missed can affect 1,000 customers.He say there is still lots of work to be done. TORONTO, Ont. 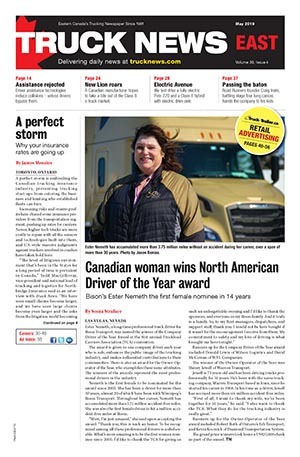 – Truck News recently interviewed John Cyopeck, the newly elected chairman of the Canadian Trucking Alliance. The following is Part Two of his interview with Truck News. TN: As chairman, what issues would you like to see the CTA tackle? Cyopeck: We have some big issues with the government from the hours of service point of view. We recently met with the federal minister in Montreal and spoke about that. And it was the same old story about the provinces having to get on board. The fact is if the feds say this is how it’s going to be, the provinces will get onside. The second big issue is that truck driving is the top occupation for males in Canada and yet it’s not considered skilled labor. There are a lot of qualified people from other countries we could have coming here. We’ve got a group going to Europe on a fact-finding mission. There is a language problem to overcome, especially if you are running north/south, but that’s secondary in my opinion. There are a lot of people who would love to immigrate here and have the skill to become a driver and yet the government has failed to recognize that it is a skilled position. TN: One of the most significant developments over the past year has been the sharp increase in freight rates. More than 80 per cent of those using truck transport reported paying higher rates. Is this a one-time adjustment, or do you see rates continuing to rise? Cyopeck: I see rates continuing to rise on a reasonable basis. But go back 20 years and see what the rates were and look at today. I would bet you will find that in many cases they are less than 20 years ago or at least have not kept up with inflation. There have been too many carriers who didn’t know their costs, didn’t know how to cost, and were afraid to ask for a rate increase. It’s about time carriers started to smarten up. Shippers have to keep their costs down as well, we understand that, but they have to realize they can’t continue to hammer us. One of the first places shippers look when trying to reduce costs is trucking. They have to realize we can’t haul for nothing. And we have to be able to explain the reasons behind the rate increases to our customers and work together. There are a lot of soft costs, such as wait times, that people don’t see but reduce efficiencies for both shippers and carriers. TN: Our research also shows that more than half of shippers using truck transport were paying increases higher than four per cent. In your estimation how are shippers responding to the increases? Cyopeck: Anybody is going to fight an increase, including our industry. I think we still have a job to do to educate shippers about our business. I don’t think there is anything wrong with going to the shipper and saying here are our rates and here are our costs – how can we best deal with this so its a win/win? You will always have the guys who will drop their rates because they are afraid of losing the business and you will always have shippers who will jump from one carrier to another. But the relationship works best when it’s treated as a partnership. The other area that would help both sides is to recognize that there are things we could be doing from an intermodal point of view. We should make better use of intermodal where at all possible. TN: Is the intermodal infrastructure sufficient to handle this demand? Cyopeck: No it’s not. But the railways have done a pretty good job in some areas in terms of transit times and service. But they still fail to recognize that when they miss service on a load given to them by a courier or an LTL carrier, it’s not one load; it’s thousands of customers that could be affected. And we can’t go to the customer and say the rail screwed up. They didn’t deal with the rail; they dealt with us. There is still a lot of work to do. We also must remember that intermodal won’t work in all cases, for example short haul lanes or time sensitive products or loads. TN: There has also been a great deal of movement on the surcharge front. Almost all shippers are paying a fuel surcharge, and about a quarter are now paying surcharges for border delays and delays at the dock, according to our research. A large part of the reason for these surcharges has been to change shipper behavior when it comes to things that create inefficiencies for carriers. Are you seeing any change in shipper behavior as a result? Cyopeck: I think the more reputable companies are starting to treat the truck driver like a human being. There was a time when the driver was treated like a dog by shippers. It has improved but we still have more educating to do. Having said that I must add that we still have more educating to do within our own industry too. 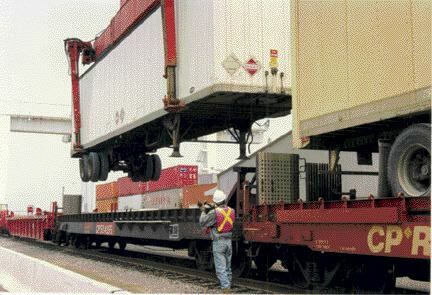 Having the right facilities in some of these loading and receiver docks is important, for example. A driver may have driven all night to get there and when he does he’s asked to park in the line. There were some places where they wouldn’t even let the drivers use the washroom. TN: The cost of fuel right now is a large issue for carriers and shippers. Fuel surcharges are representing almost 25 per cent of truckload costs for some shippers. Where do you see fuel pricing and surcharging going over the next 12 months? Is the worst over or yet to come? Cyopeck: I personally think it’s going to settle down but I don’t think it’s going to get too much lower. I hope it’s not going to go the other way because that would affect everyone right down to the consumer. I also believe you have to have an appropriate formula that recognizes the costs associated with fuel. There’s a lot things carriers can do to conserve fuel as well. This is where speed and idling control come in. We’ve got the technology such as speed governing and automatic shutdown on idling. It’s very simple to do so on a company truck. You spec it, so restrict it to the proper speed and idling limits. TN: Some have said that because of the driver shortage many carriers are reluctant to raise the issue of speed control with their drivers. Is this an issue carriers must do a better job at addressing? Cyopeck: Yes. Everybody is fearful they will lose their owner/operators if they restrict speeds. So you’ve got guys out there who spec their trucks and put a drivetrain in them that allows driving at 120 km/h. Some even spec’ them for higher speeds. Well, there’s several companies that have speed restrictions and they get by. We restrict our Canpar trucks, for example, to 90 km/h. I’ve had people tell me we are unsafe because we are driving too slow. Do you know how many linehaul vehicles we’ve had run into the back of Canpar trucks since I’ve been here? Not one. And we’ve saved a fortune on fuel by doing so. Every ten clicks saves you a fair bit. I recognize fully times have changed since I was driving truck back in the 70s. But if you have a guy going down the road at 120-km/h instead 90 km/h, all it does is give him a little extra time at the truck stop. TN: Almost half of shippers are concerned there is not enough capacity right now to handle their needs. How would you assess the capacity situation? Cyopeck: It’s a roller coaster. There will be times when capacity is tight and times when there is excess capacity. There is never going to be steady stream. A large part of this is the fact the industry has a very serious issue with attracting drivers and keeping them. It is an area we have to address as an industry – what can we do to get people to come to work for us and stay with us? TN: About 90 per cent of the current driver population of 265,000 will have to be replaced by 2008 because of retirements and people leaving the industry. That’s a monumental task. What will it take to attract such a large amount of people to the industry? Cyopeck: That’s going to be a tough one because lifestyle is so important to people now, and it should be. g in the 70s, you were a trucker, you had your freedom and it didn’t matter if you weren’t home. And you made a lot of money at it too. But times have changed, lifestyles have changed, family values have changed. You can’t expect a guy today to leave on a Sunday night and get back Saturday afternoon and then fix his truck till Sunday night. Those days are gone. At the same time we have to enhance the way we treat drivers. It’s not just about money. They’re no different than the CEO who wants his company to improve its performance every year. Drivers want to know that at the end of the year they have improved their lot. You look at most surveys and money is the third or fourth item in terms of importance. You have to explain to them what you did with the money the company made – how much money you put back into the company, how costs are going up, etc. We also have to do a better job of educating owner/operators to be better business people. Some owner/operators go out and buy a piece of equipment that probably costs $20,000 more than what they need so they can get all the chrome and all the bells and whistles they want. And then they expect the company to compensate them to pay for that. They say if I’m going to live in the truck, I want to have the best. Fine, but if you want to have the best then you have to be able to pay for the best too. If all that’s really needed to spec the truck is, say $110,000, and the owner/operator wants to spend $130,000 to get the chrome, then why should he expect the trucking company to compensate him for it? TN: How will the Kyoto protocol affect trucking? What is CTA doing about it? Cyopeck: I agree we all have to do our part on the environment. At the same time, the engine technology required will likely cost more and somebody has to pay for that. Forget the truck rates and the shipper, in the end it will be the consumer who will pay because the cost of manufacturing and transportation will go up. We will have to be resigned to the fact that everyone will have to contribute a fair amount. From the government’s point of view they have to recognize that you just can’t continue to go back to the taxpayer and add more and more burden. TN: Speaking of Ottawa, you’ve been in the industry a long time. What’s your assessment of Ottawa’s leadership and vision when it comes to transportation? Cyopeck: They’ve been weak in recognizing for the most part the trucking industry and its specific issues. The problem is that soon as you get the minister of transport in either the federal or provincial political scene educated on some of the things that are key in the industry, what happens? They change him. And they usually put someone in who doesn’t have a transportation background and so has a big learning curve. 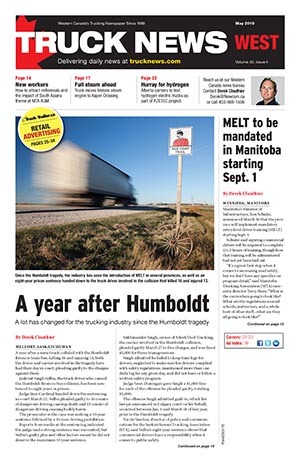 TN: The Canadian Trucking Alliance and provincial associations have had many successes in recent years, particularly in areas such as border legislation. Yet there are many carriers who are not part of any trucking association. What would you like to say to them? Why should they be involved? Cyopeck: I’m really disappointed that there are carriers, including some larger carriers, who don’t want to belong but yet want to gain all the benefits. I just think that’s wrong. I call such carriers leeches. They don’t want to spend X amount on dues, but think how much they would have to spend on legal advice if it wasn’t for the work the associations do. If you want to make things better for the industry, participate. Not only financially as a member, but participate in the committees. TN: How would like to see the shipper-carrier relationship evolve? Cyopeck: The logistics associations could really promote along with the trucking associations information meetings and the fact that shippers and carriers have to work closer together. First thing we did at these meetings was admit we had done a lousy job and then we asked them to tell us what they were upset with and how we could change it. I said I can’t make it better unless you tell me what you need us to do. I remember getting raked over the coals by one customer in particular, but you know what? That customer ended up coming back to us. The first thing we have to do as carriers and shippers is communicate. Rates will always be hammered down by them and will always be pushed up by us – it’s a fact of life. We both have to talk about what the real issues are and we have to be prepared to listen.